Kashmir- People of Kashmir are known for their patience and resiliance to fight for survival even during the most adverse situations. Inshah Bashir, a 24 year old Kasmiri woman is the brand new story of inspiration from the heavenly valley in distress; one who has defied odds to follow her passion. Inshah is the first ever female wheelchair basketball player from Kashmir who is all set to participate in the Sports Visitor Program 2019 in the US. In a life wrecking accident that happened in the year 2010, Inshah fell from the balcony of her own house resulting in a spinal injury that made her wheel chair bound since then. Nine years after the tragic incident Inshah Bashir is already in the history books for her determination and success. Life wasn’t easy for Inshah after the accident, and after an unsuccessful surgery to recover, Inshah slowly coped with the trauma with the support from her friends and family. It was during her time at the Shafqat Rehabilation Center, Inshah spotted other specially-abled people like her playing basketball in wheelchairs. Though Inshah was reluctant at first when they invited her to join the game, once she started playing, Inshah found an instant connection with basketball. Soon, she founded a renewed passion for life and her interest in basketball grew with every passing day. As she was the first among the girls to show interest in basketball, initially she had to play with boys team. In 2017, Inshah was qualified for National Championship in Hyderabad and she played for the ‘Rest of India’ team that year. 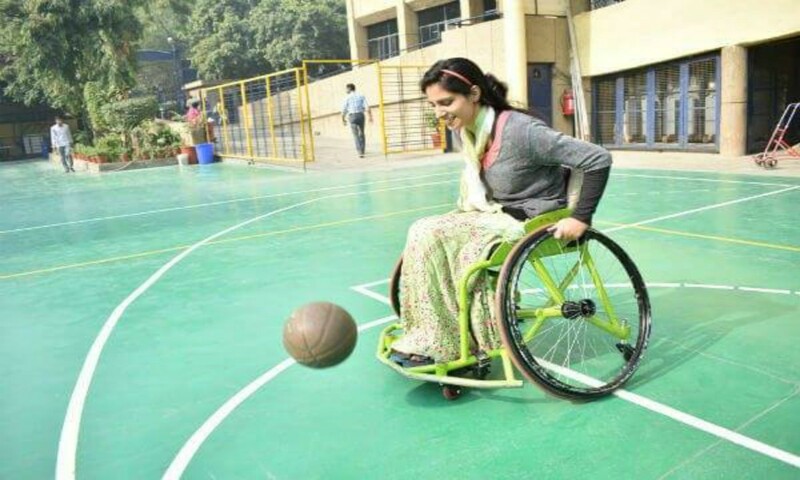 Inshah in an interview says that her practice sessions with Jammu and Kashmir boys wheelchair basketball team helped her improve her game a lot. More focused and determined than ever Inshah now goes to the gym everyday and follows specific diet instructed by her coach. However, she feels that state and central government isn’t providing enough infra structure and facilities in the region to promote the sports. The lack of friendly infra structure and eco system for specially-abled persons also deters the growth of such individuals, she said in an interview. Inshah, who is a proven fighter and survivor, shows no signs of backing down amidst the lack support from as she recently got an invitation from the US Consulate to participate in the Sports Visitor Program in 2019. She hopes to be an image of inspiration for those who have been let down by fate like her and views sports as a valve through which women could be liberated.